Campus aims to provide a safe, developmentally appropriate environment for every child. Our main focus is to provide a stimulating and positive learning environment which promotes each child’s social, emotional, physical, and cognitive development. In addition, our internationally diverse student body and faculty offers students the chance to strengthen their understanding of cultural diversity. The Early Childhood program aims to provide a high quality and developmentally appropriate education to children ages four through seven. SPAS ECE program encourages social, emotional, and intellectual growth of the young child by recognizing the strengths, diversity, and uniqueness of all who learn. Using their personal interests and creativity, we foster a meaningful, enjoyable, and enriching environment that nurtures our young minds. 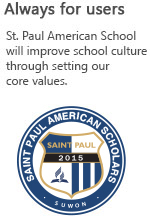 St. Paul American Scholars prepares students for professional success in the global community. The internationally diverse linkage of SPAS offers students with the opportunity of strengthening the students understanding of cultural diversity. SPAS educates students on cultural diversity to value the roots of their own and other heritages. Our curriculum equips students to become culturally literate by developing critical thinking and communication skills, as they gain a strong sense of personal and social responsibility. Mandarin for a globally sound educational growth. Non-Native speakers will take intensive ESL classes as required and determined by the school after thorough assessment of the student’s English proficiency. Middle school Program in St. Paul American Scholars is to provide students in grades 6-8 the opportunity and encouragement to develop the skills, knowledge, and attitudes necessary to make responsible decisions and to adapt to the challenges of the future through a variety of educational experiences. The main focus of Language Arts in Middle school program is to develop an appreciation of literature in its many forms, the ultimate goal being to read and write for pleasure. Students will explore short stories, plays, poetry, and novels. As they read and write they will develop an awareness of the many points of view throughout the world, and the techniques the authors used to make an impact on the reader. Learning from these techniques, students will develop their own style, writing from various points of view, with the intent to inform, persuade, and entertain. They will also learn and apply grammar and the conventions of English through mini-lessons that incorporate student writing. This course reviews and extends the mathematical concepts necessary for algebra. Students investigate, discover, and apply mathematics using a variety of real-world situations. Topics include exponents, geometry, graphing, integers, linear equations, percent, probability, proportion, ratio, rational numbers, and statistics. Problem-solving techniques, cooperative learning, and critical-thinking skills are emphasized through the use of manipulatives, computer software, and calculators. This fast-paced course challenges students to develop traditional first-year algebra skills and apply them to complex problems. Students must have a thorough knowledge of pre-algebra and be able to work at an accelerated pace. Non-routine problems and special investigations give students the opportunity to think critically and use the problem-solving strategies they learn in class. Nightly homework follows the forty-minute standard of an eighth-grade Algebra I course. 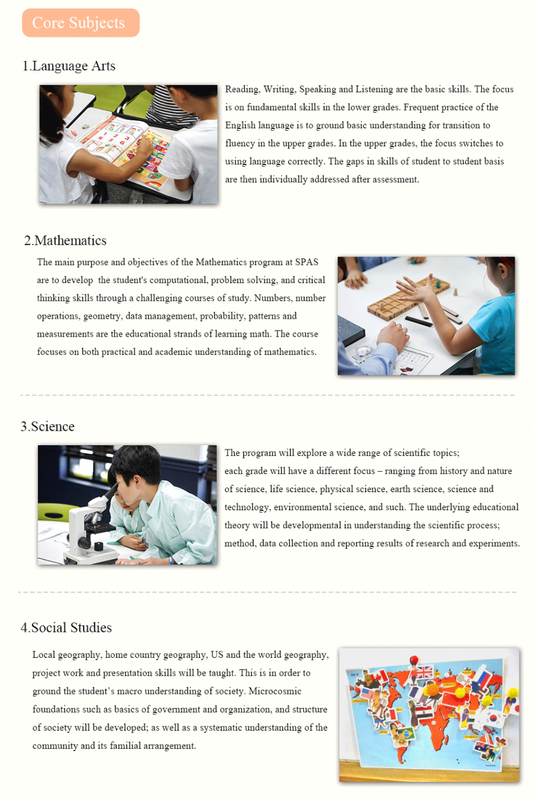 Science program in middle school focuses on various areas such as Earth science, Life Science, and Physics. Emphasis is placed on the understanding of scientific concepts and how these concepts can be used and related ot everyday phenomenon. Students are challended to look at science as a way of knowing and understanding the things that happen in the world, their lives, and their environment. Social Studies focuses primarily on geography and ancient world history. The historical focus is on the earliest known agricultural civilizations in the world. Also it will deal with government, citizenship and economics: with some geography and basic history. Students will have the opportunity to learn foreign languages such as Mandarin for a globally sound educational growth. This class allows students to experience comprehensive art practices. Students will focus heavily on basic drawing skills using elements and principles of design in order to create original, expressive, but disciplined works of art. Students will be working with a variety of materials and mediums, and will also have opportunities to write about and discuss their own works, and the works of others. This course creates opportunities for students to apply new skills and knowledge to experiencing the benefits of a physical active lifestyle. Students will be required to complete a mixture of physical activities. They will also learn about proper weight, good diet, and managing stress. This course revolves around improving physical and mental health while learning the basics of many different athletic activities. St. Paul American Scholars :: 세인트폴 수원 All rights reserved.